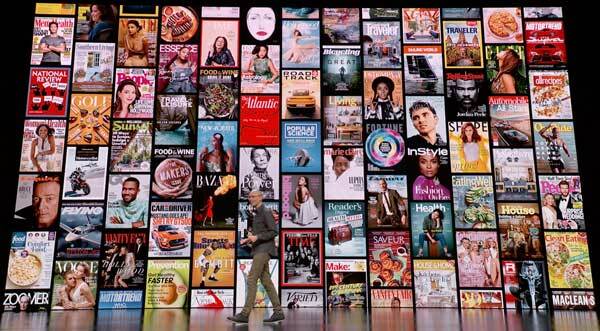 Apple News+ adds more than 300 magazines to the Apple News app, including well-known titles like Time, Rolling Stone, Wired, People, and National Geographic. These are full issues and have special features like moving graphics on covers. It also includes some subscription blogs and newspapers like the Los Angeles Times and the Wall Street Journal. The cost will be $9.99 per month, which includes family sharing. The new service is available in the U.S. and Canada today with a free one month trial. It will be available in Australia and the UK later this year. Apple Card is a new fee-free credit card coming this summer that you can sign up for on your iPhone and works with ApplePay. You can see your account information in the Wallet app and get support in the Messages app. The rewards system gives you 2 percent cash back for purchases and 3 percent for Apple purchases. Apple Card is a partnership between Apple, Goldman Sachs and MasterCard. Purchase information will be kept private and not sold for marketing purposes. There is also a physical card you can carry for times when you can’t use ApplePay. Apple Arcade is a new game subscription service coming in the fall worldwide. The monthly subscription price hasn’t been decided yet. You will get access a special catalog of more than 100 games on iOS, Mac and Apple TV. There will be no ads or in-app purchases. Apple TV Channels is a new feature coming to the Apple TV app in May. It will include a new way to subscribe to channels like HBO, Showtime, Stars and dozens of others. You can pay only for the ones you want. In addition to Apple TV and iOS, the new app will be available on the Mac, and lots of third-party TV devices like Samsung, FireTV and Roku. Apple TV+ is a new premium streaming video subscription service that will launch worldwide this fall. There will be exclusive ad-free shows from major Hollywood producers, directors and actors like Steven Spielberg, J.J. Abrams, Kumail Nanjiani, M. Night Shyamalan and Oprah Winfrey. The subscription price was not announced. The Apple Card is the only thing that I saw that I really want. I tried the Apple TV app some months ago but it seemed harder to use than simply using the four or five streaming apps that I use. I will give the new app a try to see if my “watch next” choices can be grouped according to streaming service. Apple Card sounds good. Apple News+ is promising. Will wait and see with the other services. Leave a New Comment Related to "Apple Announces Three New Subscription Services and a Credit Card"